Growing up "salad" meant a plate with iceberg lettuce, cucumber, carrot, and tomato slices, and bottled Catalina dressing. Like TV's, salads have come a long way since then. I remember in the 80's everyone started eating Caesar salad, and romaine bumped iceberg as the lettuce of choice. Then sometime in the '90s peppery salad leaves like arugula and radicchio were clandestinely added to salad plates. Back then people would disparagingly call them "the lettuce that bites you back." Ah, how things have changed. Then came mesclun, and salad was never the same. Mesculn is a mix of tender, young salad leaves. Its name comes from the French mescla meaning "to mix." Mesclun varies depending on the source but may include arugula, mustard greens, oak leaf, radicchio, red beet greens, and sorrel. "Wow! This salad has lots of flavor. You can really taste the greens," Jeff said. Talking right over him, I exclaimed, "Is that a baby beet green?" Turns out those green pointy things were mizuna. Mizuna is a Japanese mustard green with dark green, thin, serrated leaves, and a pleasantly spicy, peppery flavor. 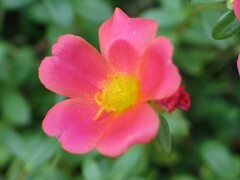 Though it has been cultivated in Japan since ancient times, it is believed to have originated in China. Most recipes for mizuna are Asian, and it features prominently in salads, soups, and stir-fries. It can be eaten raw or cooked, and it is packed with nutrients such as carotenes, folic acid, and vitamin C.
Mizuna is available at markets such as Whole Foods, and if you buy Trader Joe's herb salad mix, it's in there too. So you may have been eating mizuna without even realizing it. Just when you thought you couldn't take any more salad excitement, I have to mention broccoli flowers. 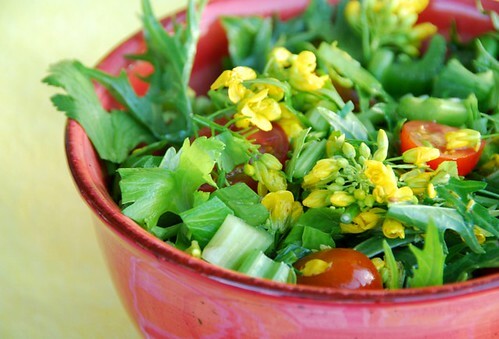 These tiny, yellow edible flowers have a robust flavor and beautify any salad. If you find them, don't hesitate to get them. They are sooo 2008. I'm sending my mizuna salad to the always Well-Seasoned Cook, Susan, the host of this week's Weekend Werb Blogging created by Kalyn of Kalyn's Kitchen. Wash and pat dry the mizuna and place in a large bowl; add celery and tomatoes. To make the dressing, whisk all ingredients in a small bowl. Add to salad; toss well to coat, then sprinkle with broccoli flowers, if using. Speaking of Trader Joe's and yellow flowers, here is a bouquet of TJ's cheerful daffodils (unlike the broccoli flowers, I wouldn't eat them). After about 6 weeks, it's time to say good-bye to daffodils until next year. 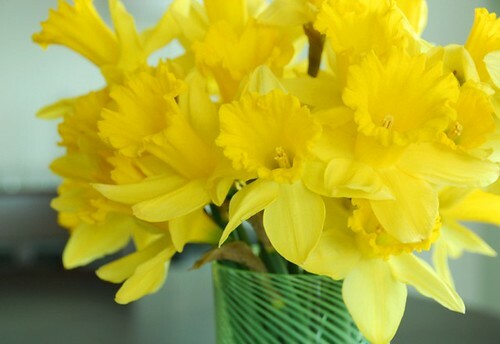 I hope Sandi likes daffodils since this is my entry for her Centerpiece of the Month. I have never seen brocoli flowers . I always love reading the talks you and Jeff. So you missed out on the Taco salad of the 70's! This is really beautiful and I'll definitely be looking for the mizuna now! Eek! I've not heard of Catalina dressing but that "classic" salad you illustrated sounds vile. Give me your exotic, beautiful (and tasty!) greens any day. I wish we had as much variety in our markets as you do, though. Many markets would not even think of selling baby greens and many people would not even think of eating flowers. Sigh. Am sure Sandi would LOVE that centrpiece Susan...it's beautiful! Love your salad conversation...ha ha! Have an award waiting for you dear girl...http://passionateaboutbaking.blogspot.com/2008/04/malted-oat-pistachio-cookies-distinct.html. very nice, Susan. I never tasted broccoli flowers: I will do so soon. Hi Susan, love the broccoli flowers, it really does look amazing! I love how jazzed you get about salads, Susan. And with something as beautiful as this, small wonder. You gave substitutes for the mizuna. Any ideas for the broccoli flowers? 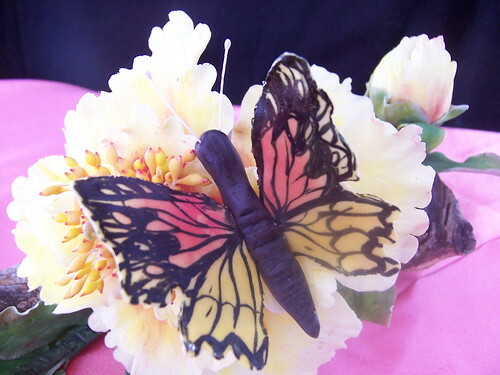 Just for color, one could add marigold petals, I know. Have no idea if the taste is even vaguely similar, though. By the way, I'm a little slow on the uptake, but I just spotted your NPR articles in the sidebar. Very cool! Never heard of these before but they sound very good. Darn! I was just at Trader Joe's buying pistachios (Deeba keeps tempting me with them). I really should have checked your blog out first b/c it's so dang hot today that a salad would be perfect. Thanks for sharing. I had to laugh with the reference to the 80's - do you remember when sun-dried tomatoes were in everything? Now, I rarely see them. A superb centerpiece Susan ...Flowers look amazing!! We're not getting any garden greens just yet, but the daffodils are finally making an appearance. I'll definitely be on the lookout for broccoli flowers this summer. i grew up in salinas, so i have definately seen broccoli flowers! our daffodils are just getting put put in the t.j.'s...we are far behind you in the flowers! Interesting about the broccoli flowers, I just thought it was the broc that had gone to seed, didn't know it was tasty. Will definitely give it a try. Thanks! You certainly know your salads! And you know how to make them stunning and absolutely beautiful! That salad could definately serve as a table decoration as well. I never knew broccoli flowers were yellow. Thanks for the enlightenment Susan! This looks like a technicolor salad, just bursting with flavor. I love dishes that look as good as they taste! happy cook-Oh, thanks so much for those kind words. tanna-Dang! I forgot about the taco salad! mark-No baby greens? Oh, no! shn-I really appreciate that. Thanks! simona-Try looking for them at the farmers' markets. 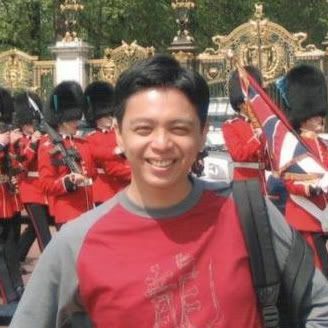 david-Wish you could taste it! terry-No, the taste of a marigold is different, much less spicy. Have you ever seen arugula flowers? They're similar in taste to broccoli flowers. And thanks! ivy-They make salad a lot more exciting. amy-I still love my sun-dried tomatoes, but they're not as "hot" as they used to be. lydia-Then spring is arriving in new England! nic-They are tasty, trust me! annie-You're welcome. I'm just a salad nerd, what can I say? What a great looking salad-- especially the colors of the salad against the colors of the bowl. Truly gorgeous. In fact, all your photographs for this post look particularly vibrant. The salad looks great. I don't think I've seen broccoli flowers. I'm guessing they must be something like the yellow flowers on broccoli raab though? I love the idea of a salad with flowers! the picture looks appetizing, susan. i love mizuna in salads. not sure about broccoli flowers, though. haven't tried those. we tend to let the broccoli flowering and seeding, but never thought to put them in salads. great info you provide here. Love your salad and the daffodils are beautiful. I will definetely look out for mizuna! Hey, I always got that look when I was an exchange student and asked about arugula, it was not popular at all at the time, well, that was 20 years ago! Mizuna is completely new to me, susan, but it looks exactly like what I had in Berlin and they called it arugula. It tasted peppery and delicious. That salad looks amazing and I'd get excited over it too! Susan, You have a way with words! I love reading your posts, and your salad looks delish! This look fabulous! I am always looking for new ways to sneak greens into my diet and I get tired of bagged baby greens melting to mush in my veggie drawer! Haha I love the TV analogy and those flowers are gorgeous! I feel healthier just reading your post about greens. That salad looks terrific! I'm looking forward to your bones event. Hmmm. Looks interesting. I'm always looking for new things to add to my salads. My husband is a bit of a traditionalist when it comes to salad so the standard iceberg/tomato/cucumber combo stil reigns supreme at Chez Cooksister. But at least he does dress his salad properly with olive oil & balsamic! Those broccoli flowers are beautiful. You're lucky, i can never find them. Thansk for posting about this salad - I agree that the old lettuce, tomato and cucumber salad is now very old hat. I love the look of broccoli flowers - I hve never seen them before, but they are beautiful! Your salads help me realize how little I know about salad and what goes into them (I just don't know enough about green leafy items). This really looks incredible and the broccoli flowers really make it look stunning. Very nice work! Both of these are new to me and I will be on the hunt for them. Isnt it amazing how the salad has evolved! Love the yellow daffodils. A rare sight here in Northern New Mexico. great information on salad leaves - I confess to not really being a huge leaf person. I think I have seen the mizuna before without any clues about what I saw but I have never even heard of broccoli flowers - i will look out for these but am still living in hope of seeing purple sprouting broccoli locally! I've never heard of mizuna but this definitely keep an eye out for it now! Beautiful salad and the title cracked me up. Just wanted to add in a light manner: don't go to France and say "mescla" to mean "to mix" though, you'd get the weird eye! It is Provencal which like many regional dialects is only spoken on rare occasions, adn only in Provence(that's where I am from), so you would leave any Parisian wondering! Mizuna is a wonderful green and it's great to see more people enjoying it, isn't it? It's peppery flavors remind me a lot of dandelion - but a bit more subtle-tasting. If I could find some nice tender broccoli flowers like those in your photo, I'd definitely make this salad. It's really nutritious and great-looking. We get very excited about salads in our house too Susan! I've never come across broccoli flowers but if I do I'll be sure to snap them up. "green pointy things" sounds like something I would say! This is a beautiful salad. I don't think I have ever seen such a lovely looking one in person before. frisée even though I've heard of mizuna. Hope I can find either of them someday that aren't in a mix. Thanks, Susan, for a splendid salad to share with WHB! The problem is iceberg has no flavor but great texture. That makes it an awesome addition to a salad, but awful to base one on. That's why it's also the best choice for BLTs. julie-Thanks so much! The colors in the salad helped! kalyn-Yes, they are like them, only smaller and brighter. arfi-It basically is the flowers when the broccoli goes to seed. Try them! maryann-Daffs just make me smile. cris-Ooh, I hope you find it; it's so robust. 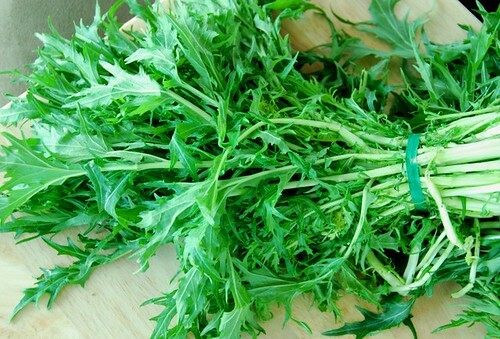 patricia-It is similar in taste to wild arugula. marie-Oh, thanks so much; I appreciate that. corinne-I know what you mean! lore-That was my dad's favorite! zen-Farmers' markets are your best bet. mike-Living here has taught me a lot about salad greens. I appreciate them so much more now. christine-I agree completely with your description. helen-You'll be glad you did. chris-Wow! That means a lot. Thanks. susan-I'm so glad you liked it. FatB-So true. Gosh, when is the last time I made BLT's? I'm very excited to try broccoli flowers. what a stunningly beautiful salad! That is a beautiful salad, I'd keep it on the dinner table for decoration :). The colors perfectly capture spring and summer's spirit.